When it comes to interior design, nothing says luxury quite like natural stone. At Canova Marble, we believe everybody should be able to enjoy its stunning beauty in the home. We have therefore made it our goal to provide the highest quality stone products at the most reasonable prices. We also believe that it is vital for customers to receive a complete solution, from the manufacture of outstanding quality products to superb installation. We incorporate all of this into our service, so you can be confident in our ability to provide an exceptional result every time. Something as flawless as marble needs an expert’s hand to ensure a professional finish. 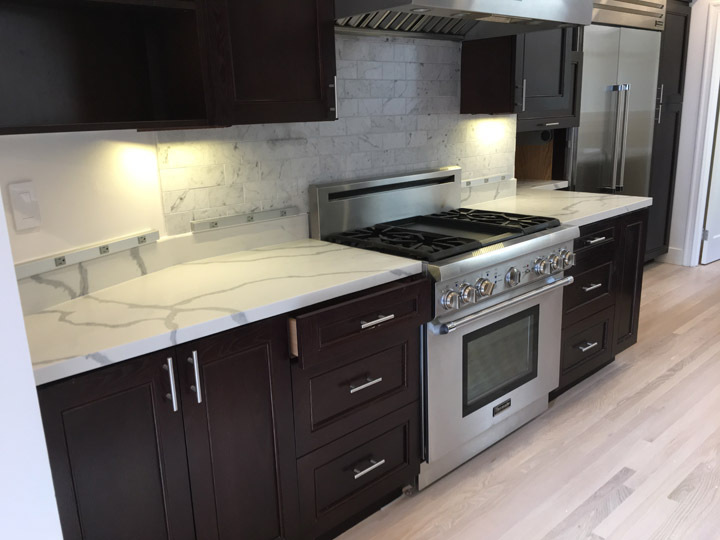 Our team here at Canova Marble have worked in the industry for many years, building our reputation for high quality products paired with unparalleled customer service. We have gained extensive experience catering to a wide range of client specifications and working with a variety of materials, including granite, marble, onyx and quartz. Our experience in working with such a broad range in both residential and commercial properties means we can produce an end result that is guaranteed to exceed your expectations. Organic stone is awe-inspiring by its very nature, and, at Canova Marble, we know how important it is to ensure that none of that natural beauty is lost when we use it to create our products. Our countertops and slabs are produced to the highest standard, ensuring that we only supply products of magnificent quality every time. We also ensure that we match your specifications exactly, so you can guarantee that not only will you receive a flawless product, but a flawless installation as well. At Canova Marble, our mission is simple; to provide our customers with top quality stone, whatever their requirements. No job is too big or too complex for our expert team to handle. We source all our stone from only the best distributors in the business to ensure that the quality of our products is never compromised. Our range includes a variety of different materials, so whether you are looking for a marble kitchen countertop or an onyx bathroom vanity, we have the perfect solution to meet your needs. Based in Oakland, California, we are ideally situated to work with clients across the entire San Francisco Bay area. We have built our outstanding reputation as leading providers of natural stone products for the home over the course of 50 years in the industry. We pride ourselves on our ability to build lasting relationships with our clients, including some of the best architects and interior designers in the business. We have a wealth of experience in catering to a variety of needs, so you can be sure that we will always deliver a first-class service.